Fan of TV Show Gossip Girl? Then you will love these new Nails Inc Gossip Girl Nail Polishes. 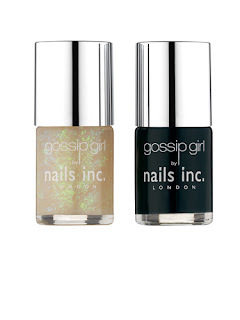 Nails Inc has launched a trio of nail polishes after the three stars of the show: Blair, Lily & Serena. Each Nail Collection features a colour polish and a crystal effect over-glaze for an electric twist. The Lily set is a Posh Plum Black with a Red/Green overcoat; Blair's is a teal black with a blue/green overcoat and Serena's is a Patent Black with an electric blue topcoat. Which Gossip Girl is your favourite?